← warning! men at work! Honestly, I really don’t like cold weather…and cold weather starts at about 65 degrees for me. But today I remembered one of my coping strategies…wool socks! They make all the difference. And when they are custom made for your feets by Annie Grook…well, if you haven’t experienced it, you can’t really understand it, but it’s a very good thing. By the way, in case you wondered, yes, it’s very hard to get Calvin to stand still squished in between your knees for a picture like this. There is much whining, writhing and screaming involved. 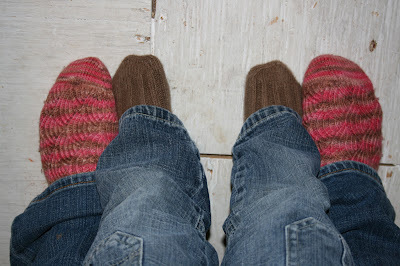 Yay for handknit socks! Thanks for dealing with the whining and wiggling… the picture is awesome. ian. i am now officially concerned for you. enjoy the “cold” weather there! it’s my favorite kind of cold – fake! hahaha. now go to sleep! it’s late. Where did that little girl come from? What happened to your little baby girl Maggie? I’m feeling old.